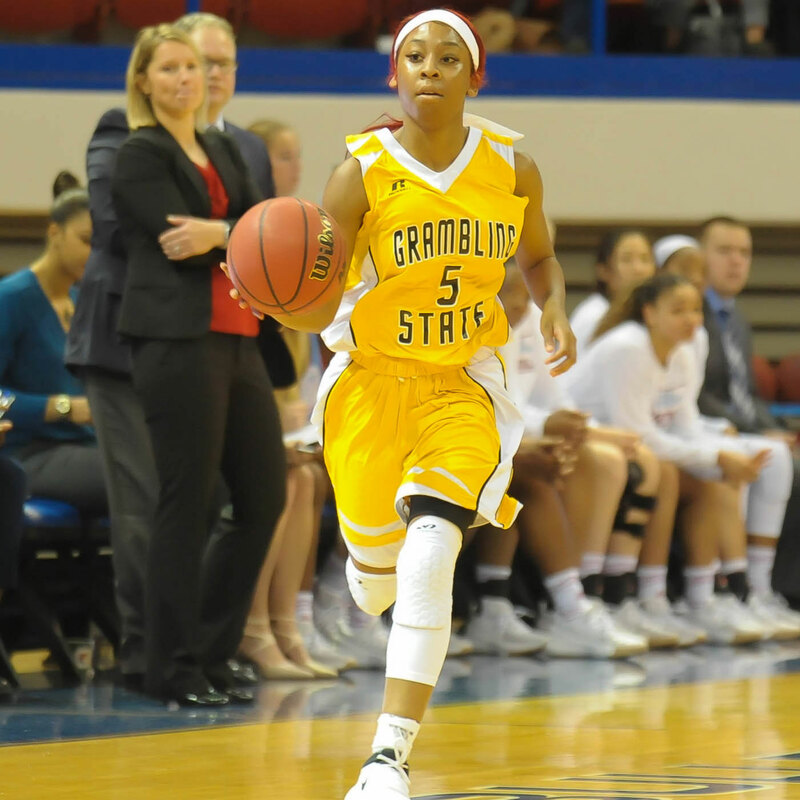 Grambling State point guard Shakyla Hill went from getting shout-outs from her mom to shout-outs from Cleveland Cavaliers star LeBron James. Her quadruple-double (15 points, 10 rebounds, 10 assists and 10 steals) on Jan. 3 against Alabama State made her the fourth woman to achieve that mark in NCAA basketball history and the first since Soja Tate of Arkansas State did it 24 years ago against Mississippi Valley State. This season, Hill has been selected twice as the Southwestern Athletic Conference (SWAC) Women’s Basketball Player of the Week, gained a national player of the week honor and reached the 1,000-point plateau. Hill, a 5-foot-7 native of Little Rock, Arkansas, grew up on an Air Force base and had her first basketball by age 3 because it was a family affair. Her second-oldest brother, Raheem Appleby, broke Karl Malone’s scoring record at Louisiana Tech and played basketball overseas for Aries Trikala of the Greek Basket League. Her mother, LaTonya Cole, played basketball until college, and her younger brother, Tyree Appleby, plays at Cleveland State University. “I don’t think that [playing basketball] was ever decided by me. I think that was decided by my parents, and all my family plays basketball, so it was never a question about whether I was going to play,” said Hill, a junior majoring in psychology. Hill played all four years at Hall High School in Little Rock and helped the Lady Warriors to the state championship her sophomore year. Since coming to Grambling State, she’s played in every game and has been a full-time starter the past two seasons. Hill is first on the team in scoring (averaging 13.6 points), field goal attempts, field goals made, free throw attempts, free throws made, rebounds (offensive and defensive), rebound average, assists and steals. She’s first in the SWAC in assists, second nationally in steals, third nationally in triple-doubles and second nationally in steals per game. The Lady Tigers are 7-11 overall and 4-3 in conference play. The team is focused on winning the SWAC regular-season championship and the SWAC tournament. Hill said she feels nothing but support from her teammates and coaches over her quadruple-double. “I think that it’s really big. It’s really big for me, for Grambling, our basketball team, and it’s also big for HBCUs [historically black colleges and universities]. You rarely ever see anything about women’s sports, especially about women’s basketball. But it’s a slim chance to none that you’ll see anything on ESPN about HBCU women sports,” said Hill. “That [quadruple-double] was a big accomplishment for me, but I also did something for my school and I also did something for black women. I really feel that that accomplishment was really big, that it was coming from a black woman and that it was coming from a black woman at an HBCU,” she said. Hill’s ultimate goal is to play professional basketball in the WNBA or overseas. Her backup plan is to become a lawyer. “Since our freshman year, I have seen her grow tremendously. She’s been staying true to her game, attacking the basket, doing everything that a point guard is supposed to do. She shares the ball, she’s not selfish and makes everyone feel like they are a part of the team,” said Grambling State guard Jazmin Boyd. The sports world showed her major love on social media after her big moment. She received congratulatory messages from the Houston Rockets’ James Harden and Chris Paul and Jacksonville Jaguars running back Leonard Fournette, a retweet from Skylar Diggins and more. Her favorite came from Cavaliers forward James. At breakfast before the team was set to play Southern University in Baton Rouge, Louisiana, coach Freddie Murray showed her the video. She burst into tears because he is one of her favorite players. Another cool effect was her Instagram following going from 8,000 to 20,000 in less than 24 hours. On Wednesday, it reached 26,400. Murray is proud of more than Hill’s quadruple-double. He says she’s playing “lights out” basketball, her basketball IQ has improved and she’s more accustomed to the speed of the game than she was when he first met her. “It’s very special. Point guards are the coach on the floor. That’s the position that any coach wants to try to address first. We are blessed to have her playing great basketball for us and having her on the team for the next year. She is our quarterback of our team, and without her we wouldn’t be where we are right now,” said Murray. Murray says she has what it takes to play professionally. But before that we’ll see her leading the Lady Tigers to new heights.